Lake Las Vegas and Henderson, Nev. (Sept. 11, 2011) – Approximately 1,700 athletes plunged into the water of Lake Las Vegas in the Marine Corps Ironman World Championship 70.3. Top professionals Craig Alexander (AUS) and Melissa Rollison (AUS) celebrated victories in Henderson, crossing the finish line in 3:54:48 and 4:20:55, respectively. Favorable swim conditions kept competitors close, but Andy Potts (USA) emerged first from the water with a 22-second lead. Potts exited T1 first, followed by Kevin Collington (USA) and Paul Matthews (AUS). Cycling on a challenging bike course that covered varying terrain and elevation through the Lake Mead National Recreation Area, Potts saw his lead diminish as a number of competitors closed the gap. The group included a solid performance from Chris Lieto (USA), who was first out of T2. Ultimately, it came down to Alexander, who flew through the run course, overtaking Lieto and capturing his second World Championship 70.3 title. Jeff Symonds (CAN) ran an amazing race to take third place. The professional women saw strong swim performances with Leanda Cave (GBR) exiting the water first with veteran Julie Dibens (GBR) close behind. Cave held the lead early into the bike until Dibens, 2009 Ironman 70.3 World Champion, made the move to the front of the pack. Dibens led through the majority of the bike course, but was followed closely by Rollison and Karin Thuerig (CHE). The race came down to the tough run course, where just as in the men’s race, the leader was overtaken by the competition. Rollison held a strong run throughout and captured her first Ironman World Championship 70.3 title with a time of 4:20:55. One of more than 50 Ironman 70.3 events worldwide, Marine Corps Ironman World Championship 70.3 featured a swim held in Lake Las Vegas and a bike course that lead athletes through the Lake Mead National Recreation Area and back toward the city of Henderson. The run consisted of three laps through some of Henderson’s beautiful residential areas with a finish line celebration at Henderson Pavilion. 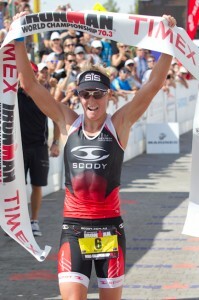 Visit www.ironmanvegas.com for event information and official results.